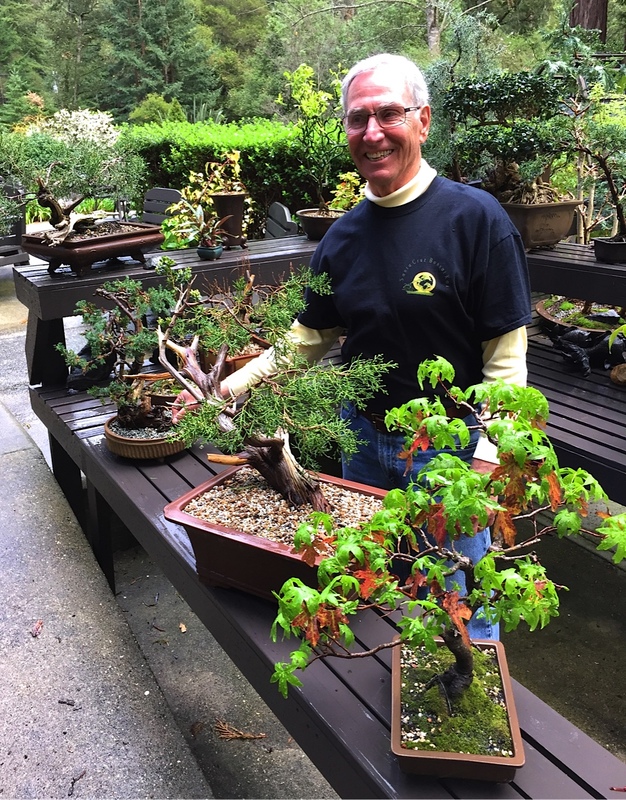 For the last few years before the Santa Cruz Bonsai Kai club has their annual show I’m honored to visit one of the members for a personal tour of their bonsai collection. Last year I viewed Marc Shaw’s collection in Ben Lomond. Marc is currently serving as president of the club. The year before it was former president, Ron Anderson’s home in Boulder Creek. Both wowed me with their talent creating such awesome specimens. This year I was most happy to be invited to visit the collection of another member, Pete Logan, at his home in Felton. Over a decade ago I met Pete as he used to come into the nursery where I worked to scour the stock of plants for interesting branching structure. You never know what you might find in the far reaches of a nursery and Pete had a good eye for potential specimens. 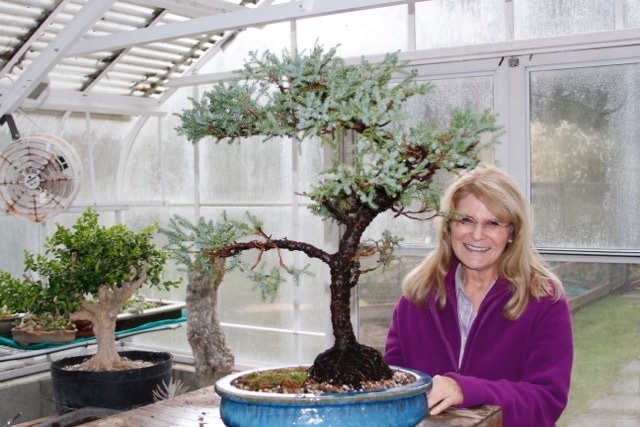 Over the years he has honed his skills in creating and nurturing his bonsai collection. 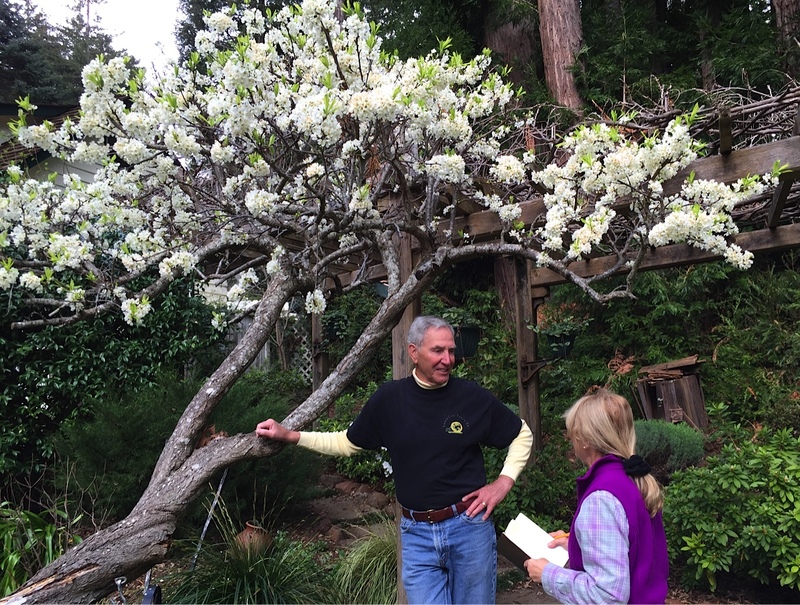 In the back of his home on the San Lorenzo River, Pete has built a pergola to shade his bonsai collection of over 100 specimens from afternoon sun. Each tree has a story as interesting as Pete’s own. After returning from combat duty in Vietman, Pete found himself suffering from anxiety but at the time no one knew about post traumatic stress disorder. 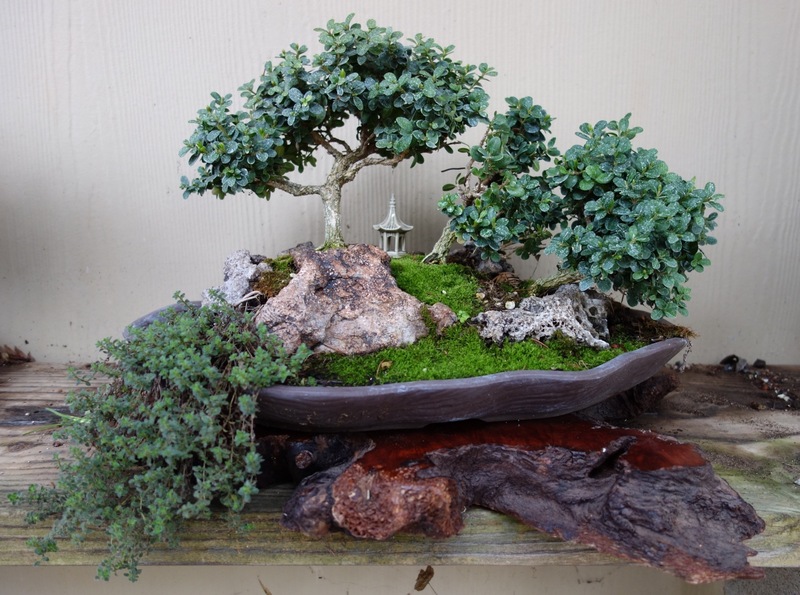 “Medication worked for awhile”, Pete said, “but it never went away,” Developing a passion for bonsai has been a way for him to relieve stress and forget everything as he immerses himself in his art. 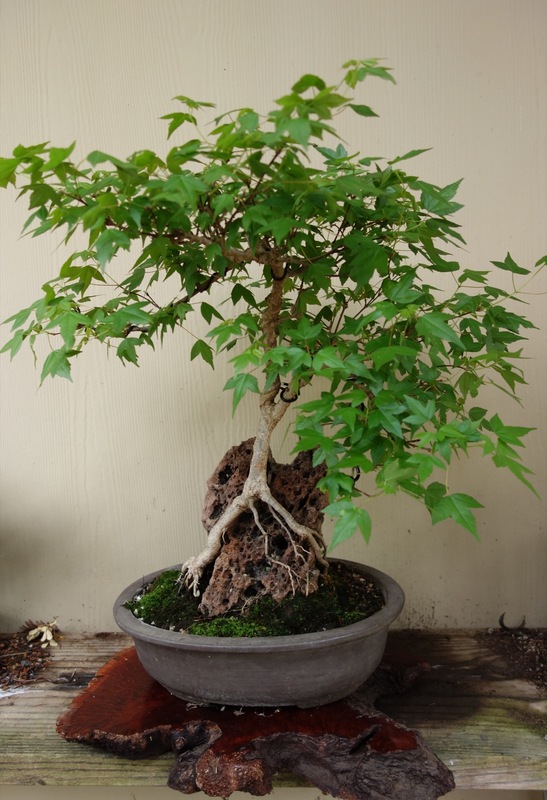 His interest in bonsai started after watching the 1984 movie, The Karate Kid. He was always interested in landscaping and plants, he told me, and one day picked up a Sunset magazine that had an article about bonsai. He was hooked. 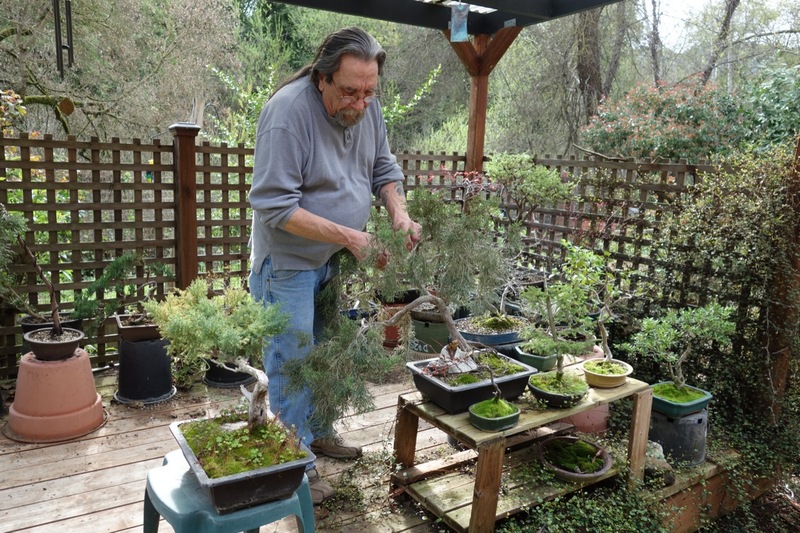 Pete describes his skills in styling bonsai as “self-taught” but that “being involved with the Santa Cruz Bonsai Kai club for almost 9 years has been very rewarding as far as the knowledge I’ve acquired and the wonderful friends I’ve made”. He says he would recommend the club to anyone interested in learning the art of bonsai. All the members of the club are busy getting ready for their annual show. Each decides which of their specimens they will offer for sale, to contribute to the raffle or to enter into the show. Moss needs to be collected to be placed over the soil and around the rocks in the pot, the correct base chosen to complement each specimen, training wires removed, pots cleaned and polished. 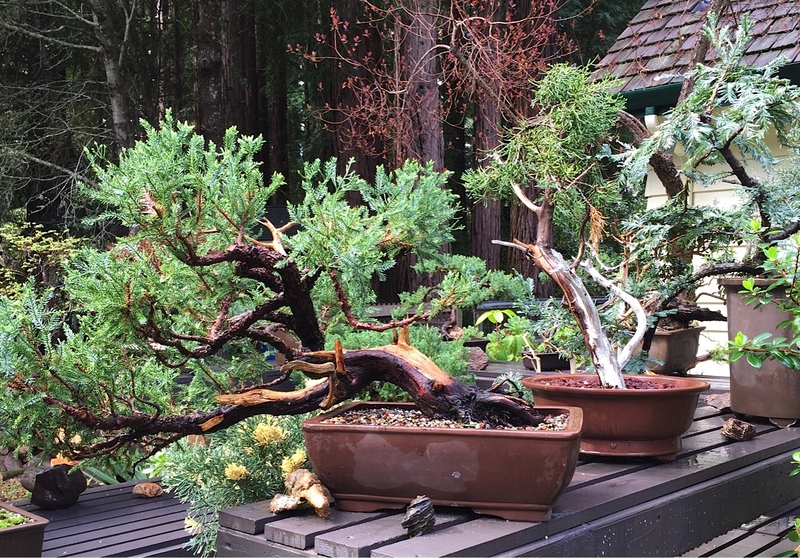 Like many bonsai enthusiasts, Pete’s garage is brimming with shelves of beautiful pots, driftwood, rocks of every color, polished redwood burl slices to be used for bases, soil mix ingredients, tools, wire and soil sieves. He loves all things Asian and has a large collection of artifacts including Chinese cork carvings. I was thrilled when he handed me a tiny cork carving encased in glass to take home. Pete doesn’t know which of his collection he will take to the bonsai show. Some, like a 15 year old liquidambar tree, haven’t leafed out yet but might in time for the show. He is training it in the bunjin style. He is also proud of a 2 foot redwood tree in the “root over rock'” or Sekijoju style. The leading branch of the tree died off and from it has created the illusion of age and the struggle to survive or “jin” as the technique is called. 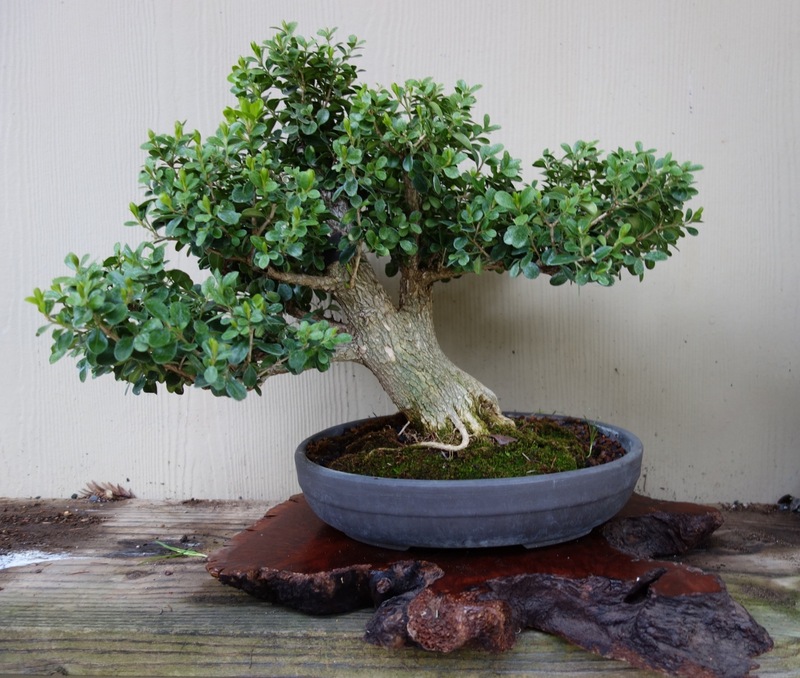 Other favorite bonsai of this remarkable bonsai enthusiast include a Chinese elm and a boxwood, both in the root over rock style. He has three different types of oaks, seven olive specimens, blooming plums, spruce, pomegranate, grapes, yaupon holly, Japanese maples and cotoneaster all in training. 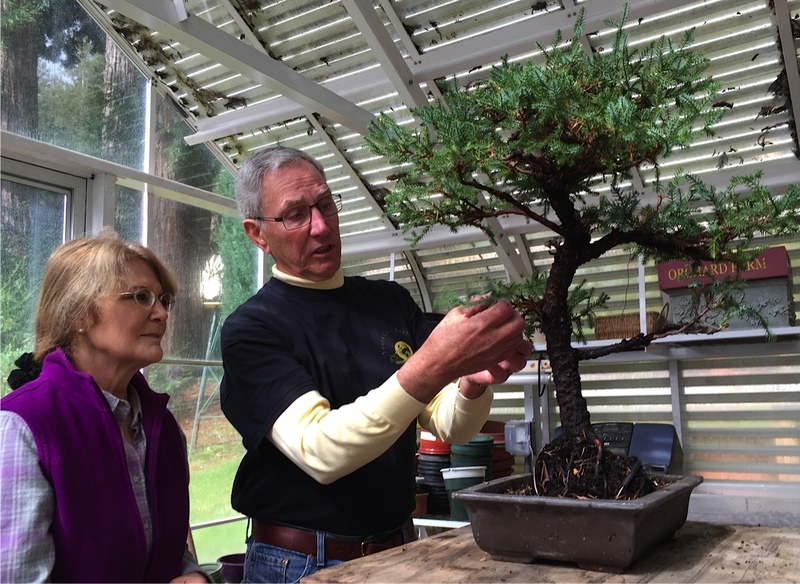 Pete is happy to share his love of bonsai with others and teaches workshops with another enthusiast monthly starting in spring at Scarborough Gardens in Scotts Valley. His next workshop is coming up on the last Sunday of April and will cover creating bonsai from nursery plants. Santa Cruz Bonsai Kai club meets monthly. 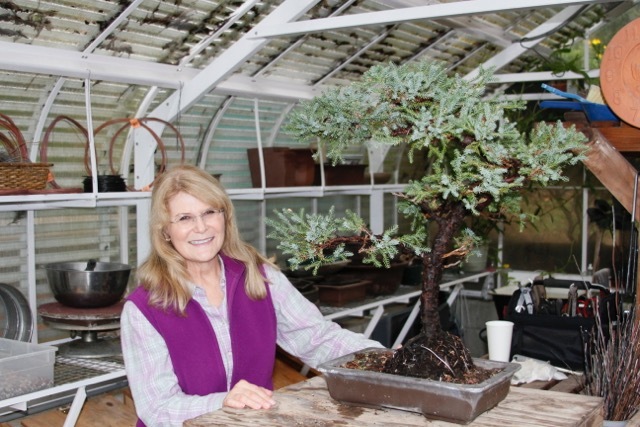 You can find out more by attending the 26th Annual Show of Santa Cruz Bonsai Kai which takes place from 10:00 to 5:00 on Saturday, March 22nd and Sunday March 23rd at the Museum of Art and History at 705 Front Street in Santa Cruz. You might even win the coveted specimen created on each day by sensei master, John Thompson. I still have my large dwarf Japanese garden juniper that I won a few years ago and it’s doing well, thank you very much.